It was John Irving who pulled me out of a rut of fantasy. There's nothing wrong with fantasy books, and I still read them today, but I'd been reading them almost to the exclusion of everything else and wanted to break the habit. David Eddings, David Gemmill, Pratchett, Tolkien, Raymond E Feist, Terry Brooks, The Dragonlance books... they were mostly excellent reads, but I was nearly twenty years old and thought I should probably be reading something a little more "improving". For some arbitrary reason, I decided I should read some contemporary American literature, and thanks to a tip from a friend, I got stuck into "The World According to Garp". It's a wonderful book, and it introduced me to the glorious, rambling sagas of John Irving. From there I jumped straight into "Hotel New Hampshire", then "A Prayer for Owen Meany", "The Cider House Rules", and so on until I got up to "The Son of the Circus", his most recent book at the time. The rut was well and truly broken. They're brilliant books all. I'd go as far as to say that Owen Meany remains perhaps my favourite book ever, certainly it's the book with the most satisfyingly realised ending. It's a masterpiece. Irving's books since then haven't really been quite as good. "A Widow for One Year", "The Fourth Hand", "Until I Find You", "Last Night in Twisted River". They're all readable enough, but they're just not at quite the same level as his earlier works. I still keep buying them and reading them, of course. His credit is still good with me. I've just finished his latest, "In One Person". It's a fantastic book, I'd say his best in twenty years. It tells the story of Billy, a bisexual man coming to terms with his own sexuality and with having crushes on the wrong people. 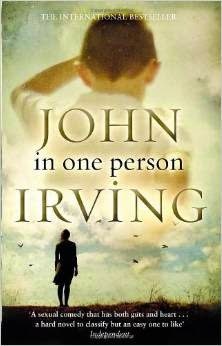 One critic I saw was raving about how Irving was touching on completely new ground as a novelist. Well, steady on there. Most of the Irving tropes, familiar to his readers, are all in place: it's set in New England, the narrator is a novelist with an absent father, there's a transsexual former sporting star, a second-rate boarding school, someone with a loud and distinctive voice, speech impediments, there's wrestling, a period spent in Vienna, there are even some bears... albeit not the usual kind found in Irving's books. Even with all of those things comfortably in place, "In One Person" still manages to tell a compelling story. "You create all these characters who are so sexually 'different' as you might call them ... and then you expect us to sympathize with them, or feel sorry for them, or something"
Well, yes. That's exactly it. No matter how far from "normal" some of these characters are (or are perceived to be), either in the book or in "Pride", they're all completely human, and every human being contains multitudes. A friend posted a link this week to an article in the Guardian suggesting that society was still afraid of bisexuality. I encouraged him to read this book, where the subject is the central pillar of the plot and is handled with enormous sensitivity. It's not a perfect book by any means: Irving is one of those novelists who likes to tie up every loose end, and he does exactly that here, but I felt that he brought the book to an end far too abruptly. For such a magnificently crafted book, the ending could almost be accused of being a little....trite? No matter. I loved it. Highly recommended. Spellbinding. Next a book where cats converse with people. Non-fiction, then. Labels: book reviews, books, culture etc.